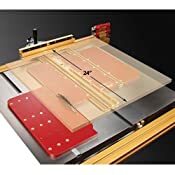 If You Own A Miter Gauge - Any Miter Gauge - You Can Turn It Into A Performance Boosting Miter Sled In Just A Few Seconds By Simply Docking It In Place On Top Of This Unique Sled. This Sled Is A Sliding, Miter-Cutting Platform That Fully Supports And Controls Your Work piece Throughout The Cut. Miter Gauges Drag Your Board Across The Table, A Sled Slides The Work piece Giving More Support And Control Creating Better, More Consistent Cuts. 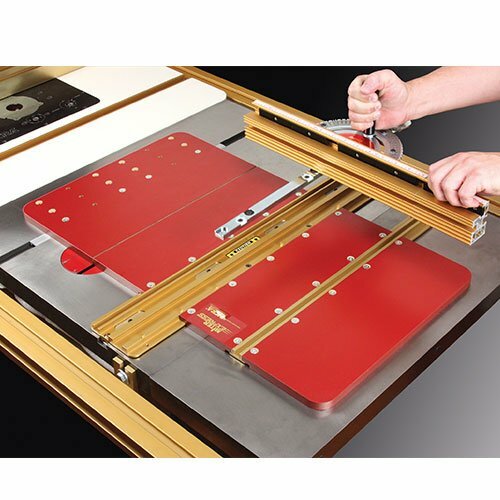 The Miter Express Is Designed To Let You Instantly Drop And Lock Your Miter Gauge Into The Sliding Platform. Once Docked, It Stays Put Until You Undock It To Switch Back To Your Regular Miter Gauge. 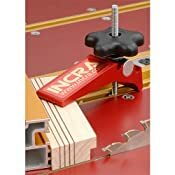 The Sled Features A Built In Miter Bar That Is Adjustable For Zero Side Play Tracking, So Even If Your Old Miter Gauge Is Loose In The Miter Slot It Becomes Rock Solid Once Its Locked Into The Express. Other Features Include Two Embedded T-Tracks To Secure The Included Hold Down Clamp To Anchor Your Work piece, A Locking Drop Panel That Supports The Offcut, And Also Provides Zero Clearance Tear Out Control. Note: Miter Gauge Shown In Photo Available Separately., Upgrade Any Miter Gauge To A Miter Sled In Seconds. 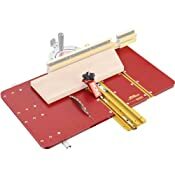 , Doubles Any Miter Gauge's Crosscut Range Up To 24" , Safely Handles Both Extra Large And Extra Small Work pieces. , Eliminates All Side Play Between Table Saw's Miter Slot And Any Miter Gauge. Doubles any miter gauge's crosscut capacity to 24"